Apple is now automatically downloading macOS Sierra to Macs that are running a prior version of Mac OS X and which are compatible with Sierra. While this may be convenient to some users, not everyone may want to have macOS Sierra show up unexpectedly, or use their bandwidth to download a large file without explicit approval, thus we’ll show you how to stop macOS Sierra from automatically downloading to a Mac. To be perfectly clear, only the macOS Sierra installer file is automatically downloaded to a Mac. 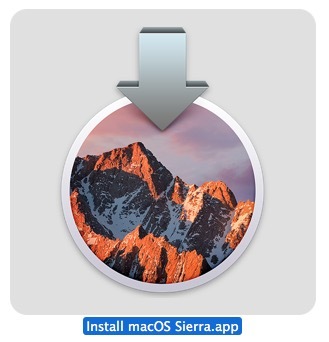 It does not automatically install Sierra onto the Mac. Thus even if the updater downloads to your computer, you can still delete it and ignore the update if you don’t want to install Sierra for whatever reason. Next, you might want to visit the /Applications folder to see if the “Install macOS Sierra.app” updater has downloaded to the Mac already. If you find the installer file and don’t want it, delete it. This file takes up about 5GB of space so if you have no intention on using it to update to Sierra or to create a USB Sierra boot installer drive, there is little reason to keep it around on the Mac. Yes, you can always re-download the “Install MacOS Sierra” update application from the Mac App Store, even if you delete it from the Mac. 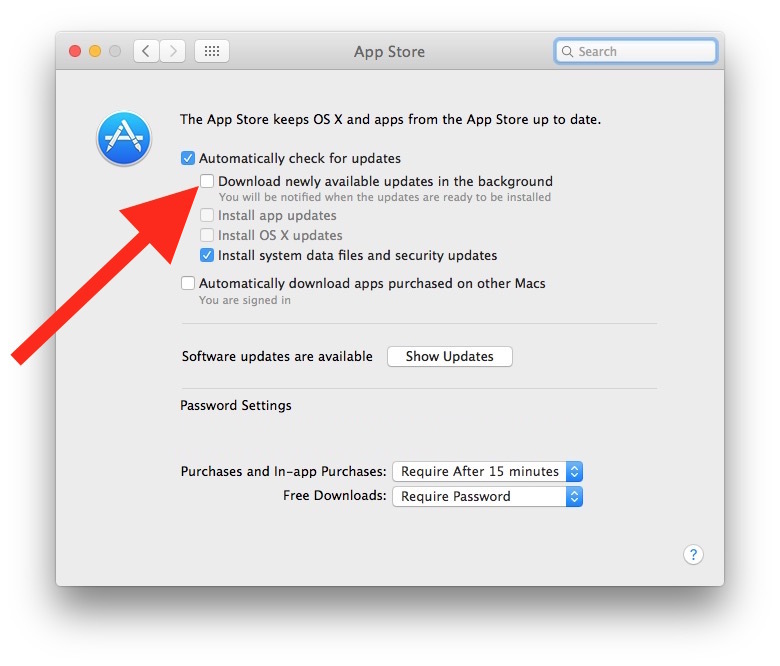 When did Apple start automatically downloading Mac OS updates? The Automatic Downloads feature has been around for years now. 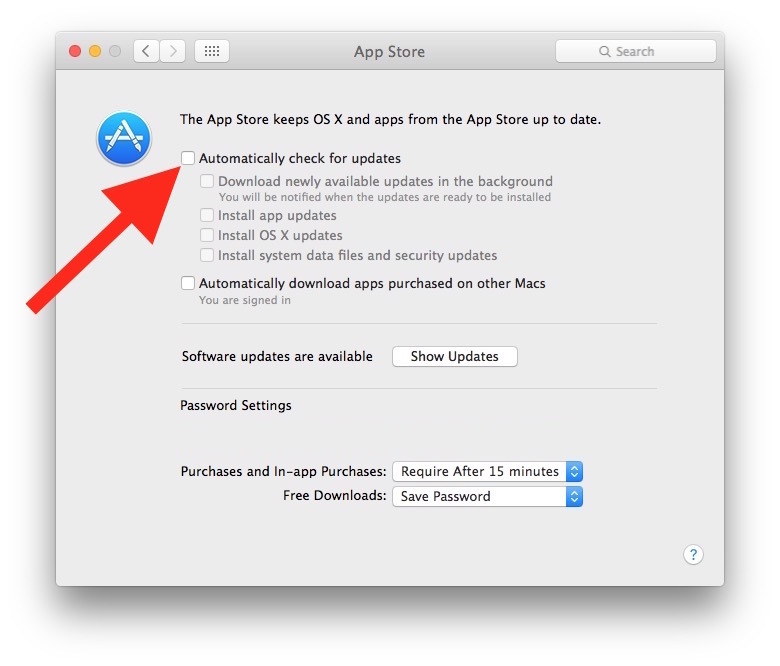 In fact, if you visit your Mac App Store settings and discover the options are already off, you may have toggled the settings before to stop Mac software update nagging or to stop automatic downloads to conserve bandwidth, and many systems administrators turn these features off to manage workstations as well. On the other hand, many users have turned on these features if they like the download and automatic install features. Of course if you already did install macOS Sierra, then the update will not re-download itself, but future software updates to Sierra will. I don’t like the idea of automatic downloads of software so I will turn this off. My internet is too slow to handle some unexpected 5gb thing and I’m postponing sierra until the second bug fix update anyway. Thanks for the heads up. I’d already had the settings to no checks on “download in the background.” This allows it to check for them, and tell me repeatedly about it, but not actually download it. Thanks for the tip though! I get lots of valuable insight from your posts! Already downloaded, already deleted. It will be interesting to see if it auto-downloads a second time. I’m scared to install it. I don’t want the microphones on all the time. I prefer to use terminal, rather than GUI. Do you have a way to turn off any and all microphones on a MacBook air late 2015? No. It just SOUNDS paranoid. Google already tries. I can’t muffle the mic, tho. Help, before my fingers do it without my consent! I do not know how to stop the app from polling the mic and eating up resources. I removed the bottom cover. I located the connectors. I disconnected the mic cable, and camera cable. I painted over the camera and mic holes with matching silver paint. Boom, no more mic or camera. I still have the option of using an external USB camera with microphone should I ever feel the need. I also use the terminal a lot. I am a Linux/UNIX guy. Do you also wear a tinfoil hat? Lol that was ment for your post above. Apple deciding when to download anything is arrogant. They have not taken into account there are some people outside of America that actually own Apple their products. A lot of those do not have free D/L or unlimited data and some (like myself) have a Sat-provider which is costly. Leave it to us to decide when we want to D/L anything to our equipment, we bought it, not lent it. Good topic and tip Paul. This tip is valid for everyone though. In fact, most Americans do not have unlimited data either, our internet services tend to be run by a monopoly provider which is often low quality, slow, and very expensive. So Apple automatically downloading 5GB Sierra unsolicited is going to impact a lot of their native customers too. OK. This time I got fed up of Apple. I use OS X for 12 years now. Having realised more and more that Apple can remotely controlled my computer and does whatever it likes with our machines or knowing that OS X regularly “phones home” is scary enough for me to transition to another OS. Logical choice for me is FreeBSD even though I know that I will have “great fun” in configuring it and that I will need to mirror my current config as close as possible to the new OS environment. Combining FreeBSD with a lightweight window management will help too! No longer need all of these fancy top cool features Apple offers for hyper-compulsive connected people. After all, as a matter of precaution (think Yahoo! ), I’m now taking steps to fly away from Apple. For those who can tweak and are not afraid with configuring an OS in the eighty’s-like way, than move on to a BSD-like OS, Debian Gnu/kFreeBSD or Debian. Or, if you are too accustomed to pressing buttons and touching/tapping frenetically your screens, go to the colorful Ubuntu… Anyway, time to fly away from all these companies stealing our privacy. Of course, Apple takes very seriously our privacy… Allow me to laugh! Remember: “Of course Yahoo! takes very seriously the privacy of its users”; now, see what happens again. It’s time for us to take control of our devices and let them communicate only when we want them to communicate! I hear your frustration, but really pretty much anything we do online is monitored regardless of which brand or type of device we’re on. It’s definitely an Orwellian present but manifested in a way Orwell never imagined – people acting as willing, paying participants. You either need to live completely off the grid or just accept this is the f’ed up world we now live in. Not one that I certainly wanted (and I imagine very few of us did), but it’s one life’s power brokers have subtly dictated for us. Sorry to be such a Debbie downer. Even with the Windows telemetry shambles currently in full swing, the temptation for me now is to switch back to Windows, with the intention of using a firewall to block all unwanted processes. On the Mac the horse has well and truly bolted, sadly. All these features and functionalities amount to an opportunity for Apple to implant these processes on your machine, making you dependent on the loss of your privacy for the use of features that don’t need it, or simply resulting in redundant traffic. And because the processes are not documented well or at all, you’ve no idea which to keep and which to fire for full operation. 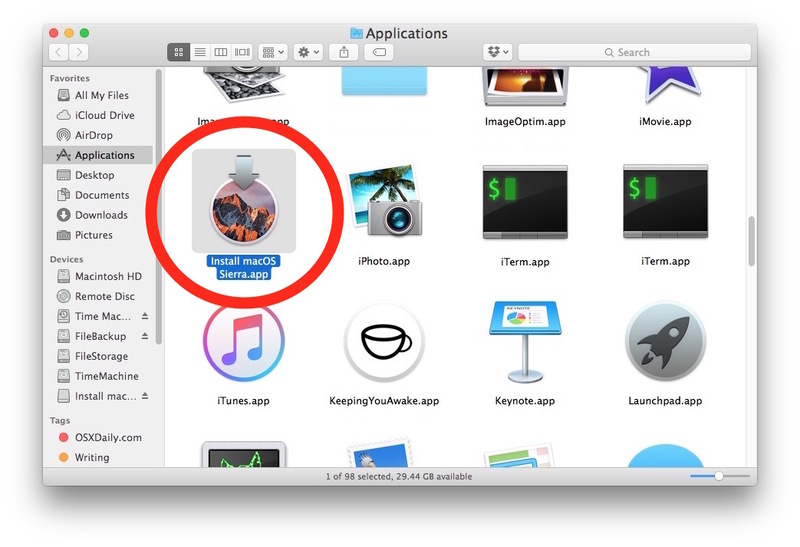 You can switch off almost every automatic feature in System Preferences, just read this story! And doesn’t Siri only wake up when you push the button in the menu, the Dock or the correct keyboard keys? I doubt there are open mic or cam lines when they are not activated by the user or by the software you are using. I downloaded Sierra but then reverted to El Cap because my E-mail wasn’t working properly. I want to wait until an updated Sierra is available before I try again. I’ve unchecked the ‘download newly available updates in the background’ and hope this will work for me. I hope that Apple is not going to adopt the same high handed attitude as M/soft in this respect. Even though my Mac Pro from early 2009 by all accounts will not run Sierra (Mac Pro 2010 or later) it was downloaded to my computer. That makes no sense. Your article says that Sierra is only downloaded to Macs running a prior version of Mac OS X and are compatible with Sierra. It seems to me that statement is incorrect in my case. I wish it was compatible but I can’t take a chance on installing it. That’s interesting, Sierra should not be downloading onto Macs that are not compatible. I wonder what apple is doing? Must be a mistake? I want to wait until an updated Sierra is available before I try again. I’ve unchecked the ‘download newly available updates in the background’ and hope this will work for me. I hope that Apple is not going to adopt the same high handed attitude as M/soft in this respect. I’ve unchecked the ‘download newly available updates in the background’ and hope this will work for me. I hope that Apple is not going to adopt the same high handed attitude as M/soft installing updates without the owners permission. So did I, but it still keep trying to download. I also object to this kind of behavior, and despite being an Apple user for over a decade, they are really testing my loyalty with stuff like this. A few days ago my internet connection went down, and I was using mobile data – I have a 1GB limit per month – only to discover that in the background my Mac had stealthily started downloading a 4.55gb file. This is just WRONG. I had no idea how long I was going to need that mobile data to get online and do essential work. I don’t need Apple hogging my goddam data with a download I never requested. Is there a way to block the installer being automatically downloaded? Like John above – the installer has tried three times to load itself (despite being deleted) while on a casual rate of 30cents a megabyte, and I only found the pause button by luck at the front of the App store. I am scared that when I close down the pause button will be reset and I will have to make a mad scramble to the app store progamme every time I log on to click the pause button. Apple is getting really annoying. Not a fan of having anything shoved down my throat. Apple, please stock this behavior. I tried to download macOS Sierra. It failed. It’s telling me to restart so it can retry. It tries but comes back to file system verify or repair. Restart. I tried several times. Nothing else is available to cancel. I can’t get anything to try and cancel. Sierra, Captain, Yooosmitee.e.. yawn, so boring and useless. Apple stopped innovating ca 2011. Surprised? Right on! I grudgingly updated to Mavericks because I had to – I develop for iOS, and Apple set things up so that new iOS version requires new Xcode version, which (for no reason other than Apple’s convenience) requires new OS X, pardon macOS version. Sick & tired of this BS from Apple (and Microsoft, and Google), and it’s been progressively getting worse. Their “let’s release a new OS at least once a year whether we have new ideas or not” mentality is costing me (as a multi-platform sole developer – macOS, iOS, Windows, and Android) so much useless drudgework just to keep my apps running, I barely have time left to fix actual bugs, let alone add new features or dig deep into the code for fundamental improvements. I am increasingly tempted to bundle my professional app with a cheap Android tablet with a locked-down OS to never be upgraded, and sell it as a device. Get your act together Apple or I’ll be out of here!